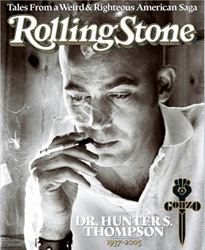 The Edge (Hunter S. Thompson) | eWakening now! The Edge … There is no honest way to explain it because the only people who really know where it is are the ones who have gone over. The others are those who pushed their control as far as they felt they could handle it, and then pulled back, or slowed down, or did whatever they had to when it came time to choose between Now and Later. But the edge is still Out there. Or maybe it’s In. This entry was posted on August 8, 2010 at 6:48 am and is filed under Uncategorized. You can follow any responses to this entry through the RSS 2.0 feed. You can leave a response, or trackback from your own site.